I was all ready to say one 2018 last place team is leaving the Bronx and another one is coming in, but then I realized the Tigers finished in third place last year despite going 64-98. Life in the AL Central must be nice. The second series of 2019 brings another rebuilding team to Yankee Stadium. The Tigers did this year what the Yankees did last year — they opened the regular season with a four-game series split in Toronto. Detroit scored six runs in the four games, including four of the six yesterday, and still managed to win twice. The Tigers are relatively early in their rebuild, though they have much more talent than the Orioles team that just left town. Michael Fulmer had Tommy John surgery a week ago and he’ll obviously miss this season and very likely the start of next season as well. That’s the big injury. Boy, did the Tigers miss their chance to trade Fulmer for maximum value or what? Regular center fielder JaCoby Jones is out with a shoulder issue and righty Drew VerHagen is dealing with arm fatigue. Jones and VerHagen are on the injured list and won’t return this series. The Tigers had a rough time at the plate against the Blue Jays despite splitting the four-game set. Manager Ron Gardenhire joked his offense was driving him to “drink heavily,” and, as a team, the Tigers are hitting .156/.250/.230 (50 wRC+) in 152 plate appearances this year. That’s with the very good Nick Castellanos and Miguel Cabrera too. Yikes. Again, Castellanos and Cabrera are the headliners here. Miggy is no longer the hitter he was in his prime, back when he was historically great, but I still don’t want to see him at the plate in a big spot. Cabrera took a pitch to the hand Saturday and was in obvious pain, then he came back and hit two balls to the wall Sunday. Dude can still mash. Ross had a nice little bounceback season with the Padres and Cardinals last year, throwing 149.2 innings with a 4.15 ERA (4.39 FIP). The peripherals (19.2 K%, 9.8 BB%, 45.9 GB%) weren’t great, though considering Ross barely pitched the previous two years due to various arm injuries, that’s a good rebound season for a dude who looked done not too long ago. The Tigers gave him a one-year deal over the winter and he’ll make his first start of the season tonight. The fastball isn’t as lively as it once was and the slider isn’t as sharp as it used to be, but Ross can really spin the ball, and he’s always thrown a ton of sliders. Even at his peak it was close to a 50/50 split with the fastball and slider. Because he doesn’t really have a changeup, left-handed batters have given Ross trouble throughout his career. The Yankees are short on quality lefty bats the moment though, so they aren’t really in position to capitalize. Last Thursday, Zimmermann did something that hadn’t been done in nearly 80 years: He had a perfect game bid through 6.2 innings on Opening Day. The last pitcher to do that was Hall of Famer Lefty Grove with the 1940 Red Sox. Zimmermann lost the perfect game and no-hit bid with two outs in the seventh and wound up with a no decision for his efforts. Bummer. Opening Day notwithstanding, Zimmermann has not been the same guy since signing with the Tigers a few years ago. Last season he managed a 4.52 ERA (4.88 FIP) with a great walk rate (4.7%) but mediocre strikeout (20.0%) and ground ball (34.0%) rates in 131.1 innings, and that qualifies as his best season with Detroit. His platoon split has been quite small in recent years, which I guess is a plus. It could easily be a one-start blip, though it’s worth noting Zimmermann went anti-fastball against the Blue Jays last week. He threw nearly twice as many curveballs and sliders (44) as fastballs (25). Zimmermann’s been more of a 50/50 fastball/breaking ball split guy the last few years. Could be a conscious change, could be small sample noise. The biggest issue for Zimmermann the last few years has been the long ball. He’s been exceptionally home run prone. Last year it was 28 homers in 131.1 innings and the year before it was 29 homers in 160 innings. That’s a 1.76 HR/9 rate across two seasons. Last August Zimmermann stifled the Yankees for five innings then bam, three homers in the span of four batters in the sixth inning. Over the years Boyd has also toyed with different arm angles and breaking balls. He’s mostly fastball/curveball/slider these days and he produced better than average hard contact rates last season. When he’s on, Boyd can be really difficult to square up. When he’s off, he’ll give up some dingers, and right-handed batters can give him a real hard time. As for the Yankees, they have this spot listed as TBA, though it is expected to be Jonathan Loaisiga (or Loaisiga with an opener). CC Sabathia’s suspension ends after tomorrow’s game, at which point the Yankees will put him on the injured list and recall Loaisiga for this start. He didn’t have a good spring (16 IP, 13 H, 13 R, 12 ER, 7 BB, 18 K, 4 HR) and has never faced anyone on the Tigers, so at least Johnny Loaisiga will have the element of surprise going for him. Jimenez, Farmer, Stumpf, and Greene all threw an inning yesterday and needed no more than 17 pitches to do it. None of them has pitched back-to-back days either. Norris threw 2.1 innings and 36 pitches on Saturday, so maybe the Tigers don’t want to go back to him just yet. Otherwise it seems everyone will be available tonight. Greene is miscast as a closer — on a contending team, he’s maybe the fourth or fifth best reliever in the bullpen– but he has A+ stuff and is effectively wild. 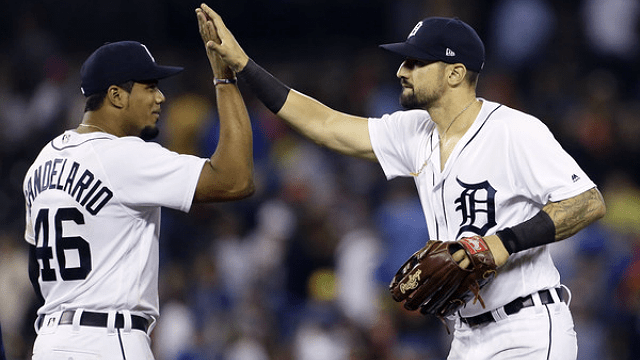 Jimenez was the selected to the All-Star Game as the token Tiger last year and has allowed 20 runs in 21.2 innings since, including three runs in an inning yesterday. Seems bad. Alcantara, Farmer, and Garrett have live, power arms. Garrett is the token Rule 5 Draft pick on the rebuilding team. As busy as the Yankees have been this offseason, they still have room in their lineup for one more bat. In a perfect world that bat would be Manny Machado or Bryce Harper. It’s not often you can sign a 26-year-old superstar caliber player. The Yankees seem content to let Harper and Machado go to other teams. It’s disappointing. It really is. Machado and Harper are not the only bats on the market. Mike Moustakas and Marwin Gonzalez continue to sit in free agency, though they qualify as good hitters more than great hitters. I’m sure the Mariners would love to unload Edwin Encarnacion and his $25M salary. He was a devastating hitter not too long ago. There are bats available. For sure. Among those available bats is Tigers right fielder Nick Castellanos, who authored a .298/.354/.500 (130 wRC+) batting line with 23 homers as the only real threat in Detroit’s lineup last year (Miguel Cabrera missed 124 games to injury). The Tigers are expected to trade Castellanos, an impending free agent, at some point this year. His agent told Anthony Fenech he hopes the trade happens soon. I get why Castellanos wants to be traded as soon as possible — it must absolutely stink knowing you’re going to traded but have no idea where to or when it’ll happen — but the Tigers are not obligated to move him now. They’ll wait for the right deal, then act. Castellanos’ agent voiced his opinion for the record and that’s that. The Tigers will do what’s best for them when the time is right. The Yankees already have four outfielders (Brett Gardner, Aaron Hicks, Aaron Judge, Giancarlo Stanton) for the three outfield spots and DH, plus Clint Frazier and the maybe possibly but probably not healthy Jacoby Ellsbury, so adding another outfielder is not a priority. The Yankees could make it work though, and Castellanos is really good. Let’s talk this out a bit. Outs above average is defense. We’ll talk about that in a bit. The offensive numbers are very promising. Great contact quality and great expected results. Castellanos doesn’t walk much (7.2% in 2018) but he’s cut down on strikeouts (22.3%) and he punishes the ball. Also, he’s 26. He turns 27 in March. That is an age when players often break out or have a career year. Whoever gets him might be buying the single best year of his career. Furthermore, few right-handed hitters use the opposite field as well as Castellanos. He hit the sixth most fly balls and line drives to right field among righty hitters the last three years. (No. 1 on that list: DJ LeMahieu.) Here are Castellanos’ fly balls from 2016-18. This spray chart looks like it belongs to a left-handed pull hitter. Think that’ll play in Yankee Stadium? The hard-hit tendencies, the non-grounder tendencies, and the opposite field tendencies make Castellanos a marvelous fit for the short porch. The kid can hit. He was a highly regarded prospect who went through some growing pains and is now blossoming into a middle of the order force. Every team could use someone like that, including the Yankees. For all intents and purposes, Castellanos is a DH. The Yankees would have to put Stanton in left field full-time and move Gardner to the bench to make this work. I suppose they could use Castellanos at third or in right in a pinch, but, generally speaking, he should not be counted on to play defense. The other option is first base, a position Castellanos has never played as a professional. The Yankees would have to give him a crash course at first base in Spring Training. That’s not ideal. My preference would be putting him at DH and letting him rake. Don’t put more on his plate and expect him to learn a new position. Not as a one-year rental. Get as much out of him as possible and move on. 3. The price might be dropping. According to Fenech, Detroit’s asking price for Castellanos is “believed to be one top-level prospect.” The Dodgers and Braves reportedly had interest in Castellanos earlier this winter and they’ve since signed A.J. Pollock and re-signed Nick Markakis, respectively. Some potential suitors are likely out of the running now, meaning the bidding war may not be as intense. That said, Castellanos is quite good, and I imagine several other teams remain in the hunt. The Indians, Phillies, and Rockies jump out as potential landing spots. If the Tigers are truly seeking just “one top-level prospect,” man, that sounds wonderful to me. The Yankees are in to win it in 2019. Estevan Florial for one year of Castellanos? Jonathan Loaisiga? Albert Abreu or Domingo Acevedo or Deivi Garcia? I’m not sure I could say no to any of that, especially the pitchers. Keep in mind the Yankees could potentially recoup a draft pick when Castellanos leaves as a free agent after the season. Not a high one — the Yankees will get a pick after the fourth round for losing a qualified free agent next winter because they’re going to pay luxury tax — but a pick nonetheless. That equals an extra prospect and extra bonus pool space. Give up a prospect to get Castellanos and the cost could potentially be offset somewhat by a compensation pick next year. The Tigers avoided arbitration with Castellanos prior to the salary filing deadline earlier this month and will pay him $9.95M in 2019. Following the Sonny Gray trade, Cot’s has the Yankees’ luxury tax payroll at $213.2M. (I have them at $221M but my estimates for various things are more conservative.) Add Castellanos and his $9.95M salary and the Yankees are still under the $226M second luxury tax tier, per Cot’s. It could work. On the field and in the books. I know Judge will never hit leadoff but damn that’s a fun lineup, isn’t it? That leaves Gardner and LeMahieu on the bench. Gardner can replace Stanton for defense in the late innings, and, if Tulowitzki doesn’t cut it, Gleyber can move to short and LeMahieu can take over at second base. Either way, there is thunder up and down that lineup. Would be fun. Castellanos is not Machado or Harper — by wRC+, his best season would be Machado’s fourth best season and Harper’s fifth best season — but he is a quality hitter who profiles well in Yankee Stadium. He can’t play defense (or run the bases) and he is another righty bat, but Castellanos would make the Yankees better and deeper. And, if the asking price is “one top-level prospect,” gosh, that might be too good to pass up for a team in position to contend for the World Series. Four more games remain in the Yankees’ penultimate homestand and it’s another of the AL Central’s rebuilding squads. Next up: the Detroit Tigers. The Yankees made a brief stop in Detroit for a doubleheader on June 4, splitting the two games after losing the nightcap. Luis Severino dominated the first game, allowing just two runs (one earned) over eight innings while striking out 10. He allowed just five baserunners. Gleyber Torres, Greg Bird and Austin Romine all homered to knock out Drew VerHagen early in Game 1. 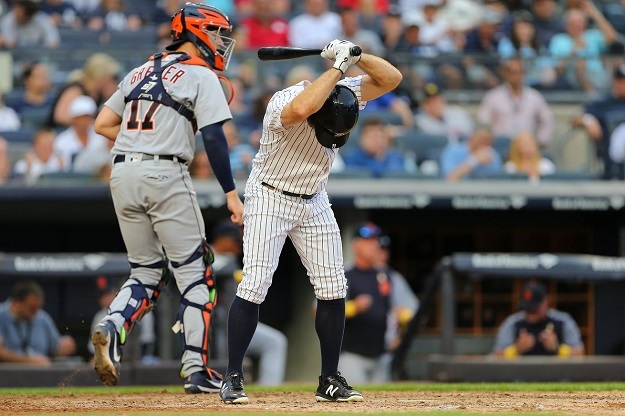 Domingo German couldn’t cut it in Game 2 and the Yankees’ bats came up short in a 4-2 loss. Giancarlo Stanton was hit by Mike Fiers, who has some history with the slugger, leading to this homer and reaction from Stanton. Your browser does not support iframes. For more information, check out Katie’s Yankeemetrics post on that twin bill. Miguel Cabrera is out for the year after left biceps surgery while backup John Hicks is also gone for the year. Shortstop Jose Iglesias underwent an MRI in New York on Thursday after suffering a lower abdominal strain and was placed on the 10-day disabled list. On the pitching side, lefty Blaine Hardy is out with elbow tendinitis while Daniel Norris is on the mend from left groin surgery and could pitch in this series. The Tigers stand at 53-80, tied with the White Sox for the third worst record in the American League and third place in the AL Central. Detroit has lost five straight games, all coming against the similarly putrid Royals and Southsiders. Their 19-46 road record is the worse only than the Orioles in all of baseball. On the personnel side, a few starters have put up respectable numbers while their offense has been quite poor. The team dealt Mike Fiers and Leonys Martin (get well soon!) at the deadline. I’m guessing Goodrum slides into Iglesias’ spot in the lineup and Rodriguez moves onto shortstop. The Tigers have just a three-man bench right now even after adding Dawel Lugo to the active roster in place of Iglesias. That will change Saturday with callups. After a strong start to the season, Francisco Liriano has come back down to earth some, particularly in the late summer. Liriano has pitched to a 4.82 ERA overall, but the 34-year-old has a 5.32 ERA and 1.90 WHIP since the All-Star break, failing to get through six innings in any of his starts. His walks have risen and he’s seen a parade of hits. Ron Gardenhire gave Liriano a few extra days off before this start. The left-hander has essentially eschewed his four-seamer entirely and uses his sinker 41 percent of the time. Outside of that, he’s still the same heavy-slider pitcher we know and love with 1/5 changeups to boot. The other veteran on the staff, Jordan Zimmermann has fared much better in 2018 than 2017. After he was tied for the MLB lead in earned runs allowed last year, he’s improved, sporting a respectable 4.38 ERA over 100 2/3 innings. The former National has seen a steep rise in his K rate while also cutting down on his walks, a nice recipe even if he allows 1.61 HR per nine. Zimmermann throws 45.1 percent fastballs, averaging 91.2 mph with the heater while going to his slider a third of the time and mixing in some curveballs and occasional changeups. His slider has been his most effective pitch and he works it in the mid-80s. Right now, the Tigers have a four men in their rotation with the fourth, Michael Fulmer, starting Wednesday. Therefore, the Sept. 1 start has plenty of options, one of whom could be Daniel Norris. He made a rehab appearance in Toledo on Sunday, throwing 72 pitches over four innings. As mentioned above, Norris is rehabbing groin surgery he underwent earlier this year. If not Norris, we could be in for a dreaded bullpen game. Considering the expanded rosters, that could mean a whole slew of young relievers. Oh boy. 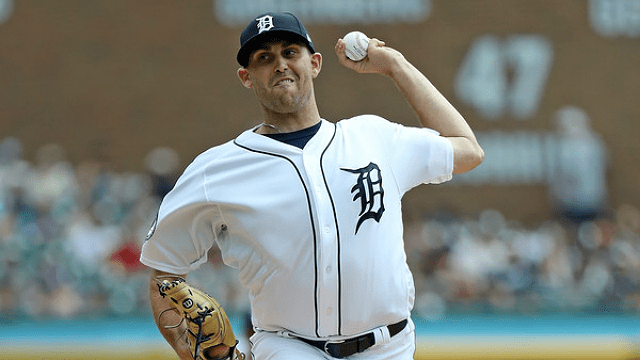 Matthew Boyd has been one of the Tigers’ most reliable starters this season after being hit hard in 2017. At 27 years old, he’s put together 147 innings with a 4.22 ERA and a 3.98 FIP. 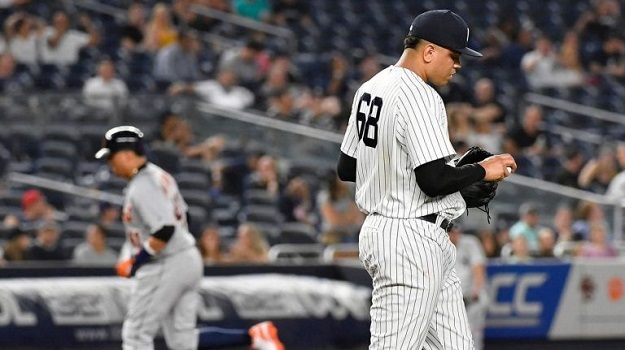 The good news for the Yankees is that he is much better at Comerica Park (2.56 ERA, 5 HR in 70 1/3 innings) than on the road (5.75 ERA, 12 HR in 76 2/3 innings). He hasn’t had a significant platoon split this season. Featuring a similar repertoire to Zimmermann, the southpaw works off a low-90s fastball with over 30 percent sliders and a mix of 70s curveballs and changeups. According to Fangraphs pitch values, he’s had one of the most effective sliders in baseball this season. The team needed 4 1/3 innings out of five relievers Wednesday, though they’ll receive the boost of September callups in just a few days. 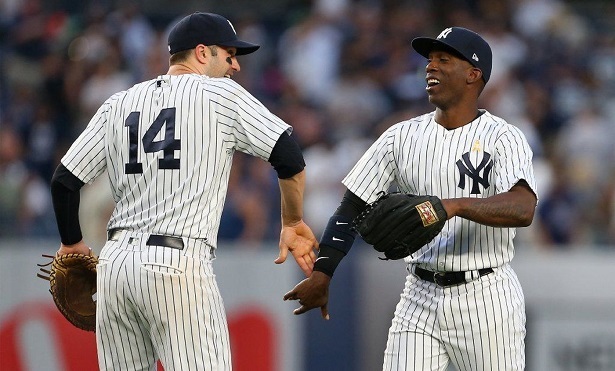 Greene was the price the Yankees paid to get Didi Gregorius while 40-man roster presence Johnny Barbato pitched 13 lackluster innings as a rookie for the Bombers in 2016. This is the type of offense the Yankees should shut down. Could be nice to see the Wild Card Game starting candidates (Happ, Severino, Tanaka) go on a roll vs. the Tigers.